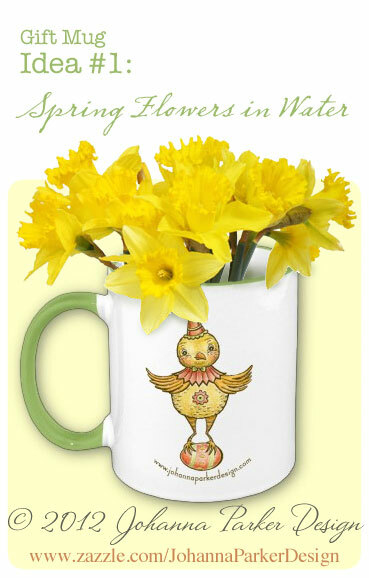 Spring is certainly a time of celebration and smiles as mother nature slowly wakes up from her long winter's nap. I always look forward to the warming of the mornings and the chance, to at last, take my hot cup of coffee or tea outdoors and explore the latest buds and blossoms in the garden. It's a lovely way to wake up and start the day. As the two go hand in hand, I thought I would have a litte fun and share with you 6 Sweet Ways to Give the Gift of Spring in a Mug! I currently have 2 illustrated mugs available in my Zazzle Shop that promise to make the perfect spring gift to both family and friends (or yourself!). Whether it's in celebration of Easter, the changing of the seasons, a birthday, a thank you, a hostest gift or just an act of simple kindness, these suggestions promise to bring smiles to those you share them with. The mugs are certainly custom and unique and serve as a functional base and vase for whatever you choose to fill it with in your presentation. The ideas are certainly endless, and if you have more, please feel free to share them here with our readers. Enjoy and THANK YOU for spreading smiles through my art! * Idea # 1 gets top ranking with me as it is probably the easiest and most cost effective to produce. Plus, the results are so dear! Spring invites a whole host of flowering bulb plants that often pop up all over the landscape. Snip a few from here or there. Daffodils are always a favorite, so just trim them to height and place in water. If your flower-filled mug must go on a journey before it is gifted, then anchor your flowers in wet floral foam, cut to size. This keeps those pretties fresh and firmly grounded while eliminating the splashing of water and potential spills. * Although Idea # 2 takes a little more work, the results are too sweet for words! A tuft of fresh wheatgrass spells out spring, and health-minded folks love to juice it in their smoothies. Wheatgrass can be found at most health food grocers in the produce section. Purchase a square of it and cut it to size and stuff it into your mug. Alternatively, with more time and patience, you can grow your own with organic soil and wheatgrass seeds. With a little care, your grass will be perky in 10 days or less. I poked a pink lollipop in for pizazz, but again the ideas are endless. 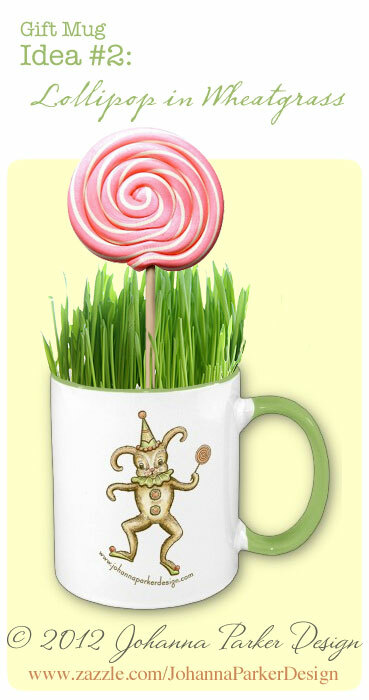 The recipient can keep the lively mug in their windowsill till the grass is used or fades, or they can even share it with their feline friends who also adore this green treat. In the end, they are still left with an adorable mug. Just wash well and enjoy! * Idea # 4 is certainly for those with a sweet tooth! 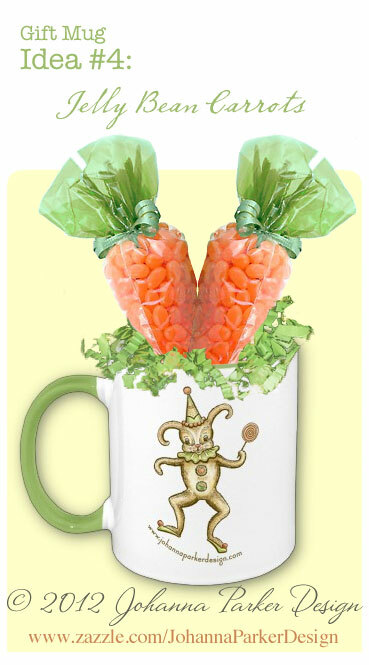 Fill carrot cellophane bags with orange jelly beans and ground them in a base of spring green paper packing grass. These bags are easily found online. Do a search for "cone shaped cello bags" or "carrot cellophane bags" and you should find a variety of vendors offering cone shaped packaging, perfect for this sweet application! * Idea # 5 takes sugar to a higher level of sweetness! 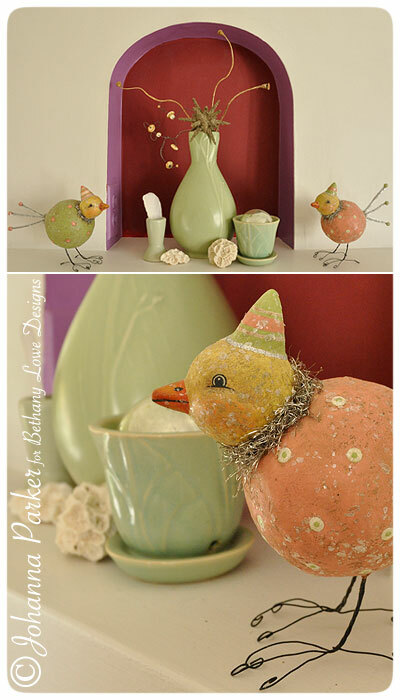 Make a bouquet that celebrates the well-known "peep"! 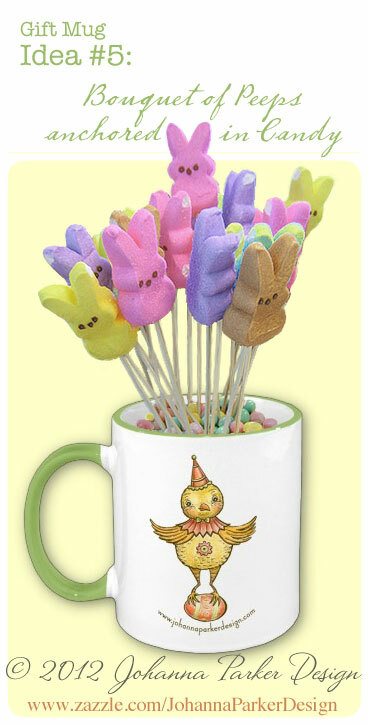 Poke these marshmallow bunnies or chicks into wooden skewer sticks, cut to length if necessary and anchor them into a mug fill with spring-hued candies, such as M&M's. 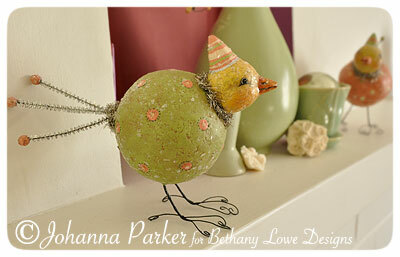 What an adorable hostess gift this would make at a spring party. Suddenly, your unique gift takes center stage! * And Idea # 6 showcases the traditional chocolate bunny. Make sure to purchase one that will fit snuggly in your muggly :) With a little spring green construction paper and scissors, cut a continuous strip of zig-zaggy paper grass. 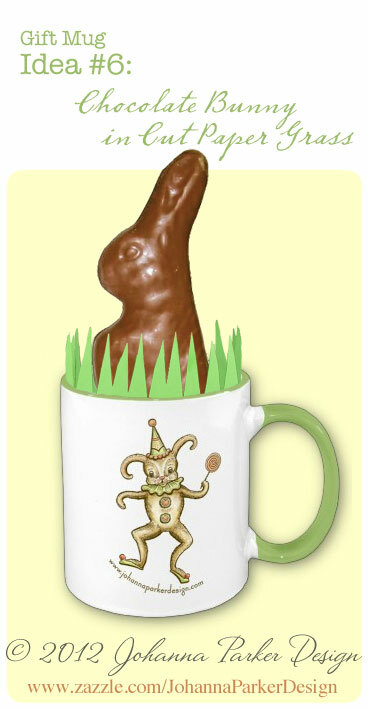 Cut to fit the diameter of your mug, tape it end to end and tuck it down & around your bunny. 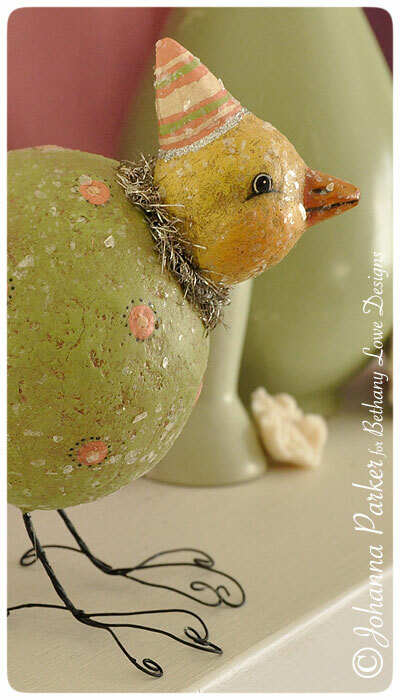 If you find him wiggling around too much, tuck a little tissue paper down below and around him to set him just right, and add those decorative blades as your final touch! 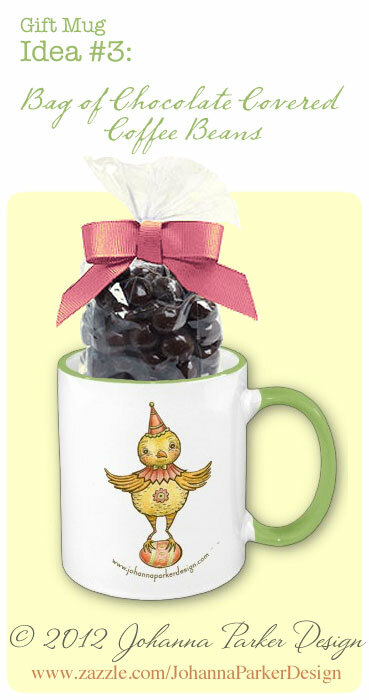 I hope I have inspired you with these 6 Sweet Ideas to Bestow Spring in a Mug! As I said earlier, please feel free to comment with more fun ideas. Sharing is caring, and it is always FUN to hear from you.